THE HAUNTED BOY Big Screen World Premiere-SOLD OUT! SECOND SHOW ADDED October 28th Halloween Event/Demon costume contest! The Haunted Boy THE SECRET DIARY OF THE EXORCIST. DVD review Highest Rated DVD to date ~ 5 skulls " A Must See!" " Do not miss this one." "The Booth Brothers Score another Hit with This Paranormal Powerhouse" HAUNTED AMERICA TOURS. 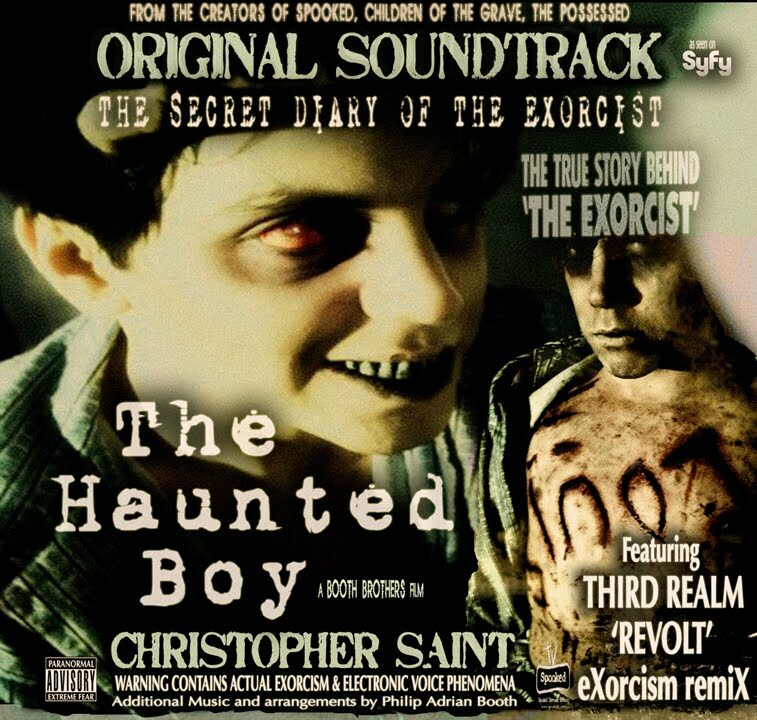 With moody music created especially for the film by Christopher Saint Booth, paranormal evidence such as real-time EVPs and camera-captures, and disturbing archival, architectural, and expert evidence, the Booth Brothers’ The Haunted Boy is a do-not-miss for Halloween and a must-own for paranormal experts and fans alike. Bravo! Highest Rated DVD to date ~ 5 skulls " A Must See!" " Do not miss this one." HAUNTED AMERICA TOURS. For the first time ever we investigate the real Exorcist house and the infamous Haunted Boy's bedroom where this horrific possession and exorcism occurred. Finally someone has gone where I had nightmares about. That infamous movie that kept me from not sleeping for over two decades, I now know the truth. The paranormal evidence is scary but the real family is even scarier. The DVD is packed with bonus features. I was blown away, what more could you ask for. --Horror Film News. THE HAUNTED BOY - See the Unholy truth in theaters October. 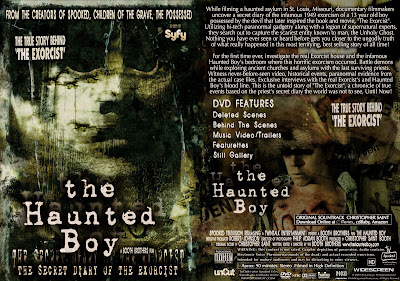 THE HAUNTED BOY - SEE THE UNHOLY TRUTH! On Thursday, October 21, 2010, "The Haunted Boy, The Secret Diary Of The Exorcist" will premiere on the big screen at the historic Tivoli theater in The Loop, St. Louis, Missouri. Doors will open at 8pm and you will be able to meet the filmmakers (Booth Brothers) themselves and some of the cast featured in the movie. Then at 9pm, everyone in attendance will see "The Haunted Boy" on the big screen! Be sure to bring your crucifix and Holy water! This will be followed with a question and answer session where you will be able to ask the filmmakers (Booth Brothers) and cast your questions.This premiere is open to the public and tickets and seating are limited on a first-come, first serve basis. So please arrive early. Advance tickets are available online at www.thehauntedboy.eventbrite.com and at the Tivoli Theater box office the night of the event. Every ticket holder will also get a free copy of the actual Exorcist's diary. "One HELL of a Show!" Event management for THE HAUNTED BOY Big Screen World Premiere! 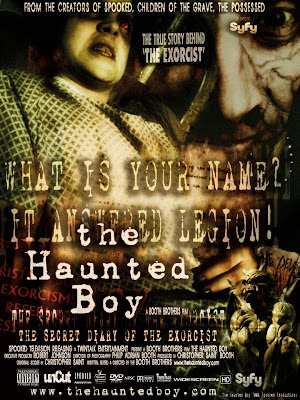 The Haunted Boy, The Secret Diary Of The Exorcist. Big Screen World Premiere at the Tivoli Theater in St. Louis! 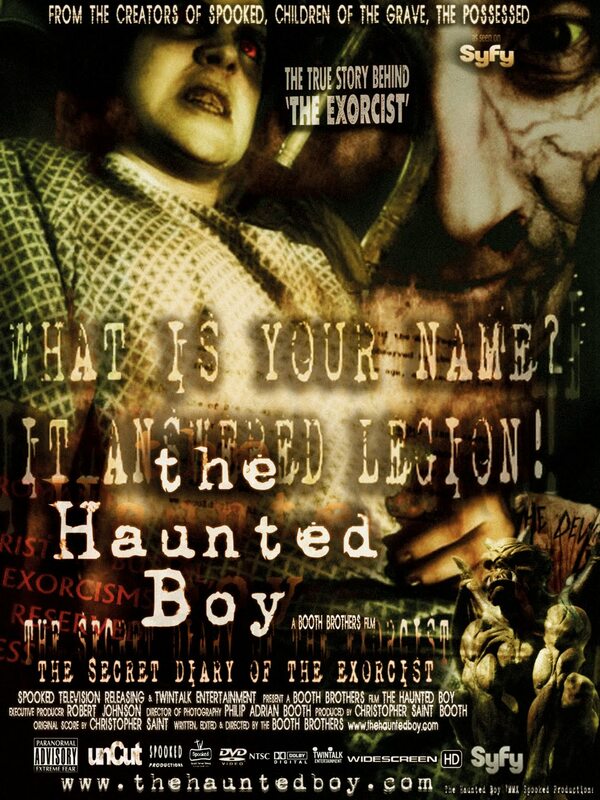 The Haunted Boy, The Secret Diary Of The Exorcist. Big Screen World Premier at the Tivoli Theater in St. Louis! THE EXORCIST RETURNS HOME! Time: October 21, 2010 at 8pm-12am. Location: The Tivoli Theater.6350 Delmar (in The Loop), St. Louis, MO 63130 (314) 995-6270. Organized By: Spooked Productions/SyFy. Email: events@spookedproductions.com. Event Description: On Thursday, October 21, 2010, "The Haunted Boy, The Secret Diary Of The Exorcist" will premiere on the big screen at the historic Tivoli theater in The Loop, St. Louis, MO. Doors will open at 8pm and you will be able to meet the filmmakers (Booth Brothers) themselves and some of the cast featured in the movie. Then at 9pm, everyone in attendance will see "The Haunted Boy" on the big screen! Be sure to bring your crucifix and Holy water! This will be followed with a question and answer session where you will be able to ask the filmmakers (Booth Brothers) and cast your questions.This premiere is open to the public and tickets will only be available at the Tivoli Theater box office the night of the event. Everyone with a ticket will get a free copy of the actual diary kept by Father Bishop in this last exorcism conducted in 1949 by the Catholic Jesuits in St. Louis. This is the real story of, "The Exorcist". Cost - $15.00 per person - plus receive free copy of the diary! DUE TO HIGH DEMAND FOR THE HAUNTED BOY (DVD/Uncut Edition), SPOOKED TV IS NOW ACCEPTING PRE-ORDERS. 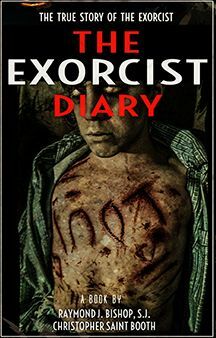 Order today and receive Free Exorcist Diary! 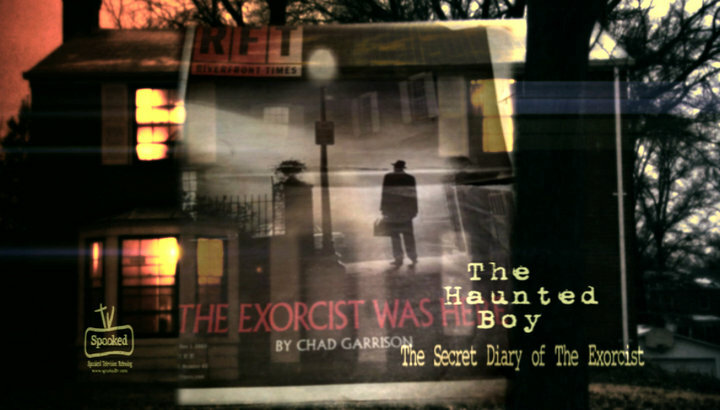 THE HAUNTED BOY, The Secret Diary Of The Exorcist. (DVD/Uncut Edition) Spooked Television Releasing (2010). Unrated/Packed with Bonus Features. LIMITED EDITION: Order today and receive FREE, an authentic copy of the real Exorcist's secret diary with your DVD purchase. Hurry while supplies last. This offer is only for the first 1000 DVD's sold and not available in stores or at Amazon. 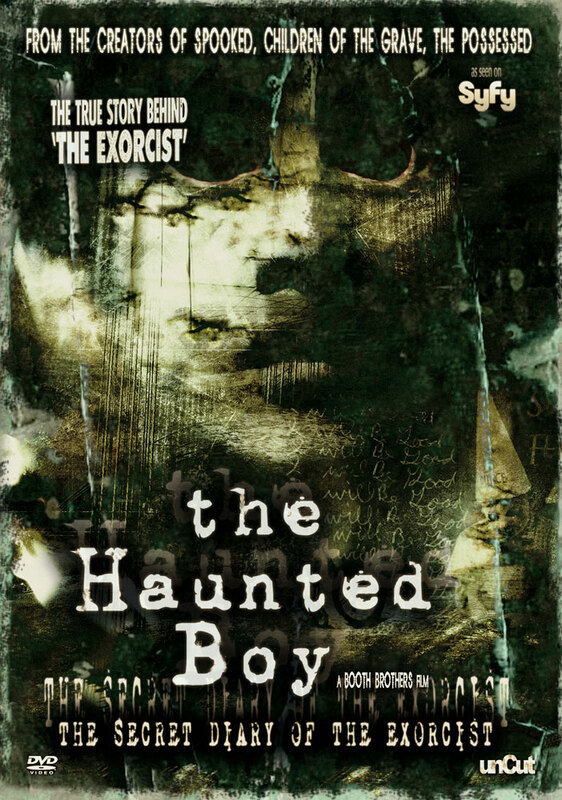 THE HAUNTED BOY ((DVD/Uncut Edition) & Diary only $24.95 + shipping & handling (CA, MO, KY add state tax) USPS- USA delivery 1-3 business days. Ships Oct 1, 2010. 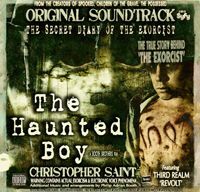 The Haunted Boy, The Secret Diary Of The Exorcist © MMX Spooked Productions. All Rights Reserved.